Chatuchak is among the most popular must-see places in Bangkok and draws many thousand visitors on a normal weekend. This is not without good reason. Boasting more than 8000 stalls, it is undeniably the biggest market in Thailand and features an incredible variety of products. It sells just about everything you can imagine. Whether or not you know what you’re looking for, it is worth taking the time to explore this unique place! It’s about 9:30 am when I arrive at Chatuchak. I see people criss crossing the main avenue that encircles the entire market, but for the most part it looks empty. This is not surprising, however, and only partly due to the fact that it’s still early. It’s April and the sun is already blazingly hot in the morning. As soon as people glimpse something of interest, they disappear in the cooler and shaded side streets which are called soi. 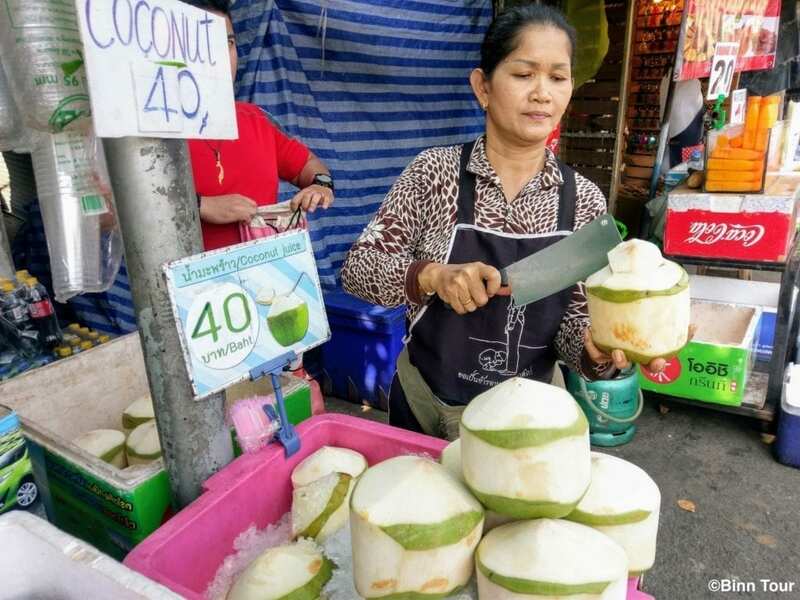 Before I step into the shopping maze myself, I resfresh myself with some coconut juice – perfect on a hot day like this! I must admit, I didn’t come here just to visit. A friend of mine asked me to buy something from a particular shop in Chatuchak. Could there be a more impossible task? There are no street signs inside the market and Google Maps isn’t really helping. Moreover, it’s easy to get lost when you make more than two turns. However, there is a system to locate every single market stall in Chatuchak. Every soi branching off from the main street is numbered and grouped into 27 sections. Once you have identified the section and the soi, which is fairly easy when you’re on the main road, you need to look out for the number of the alley intersecting the soi and finally for the number of the market stall itself. 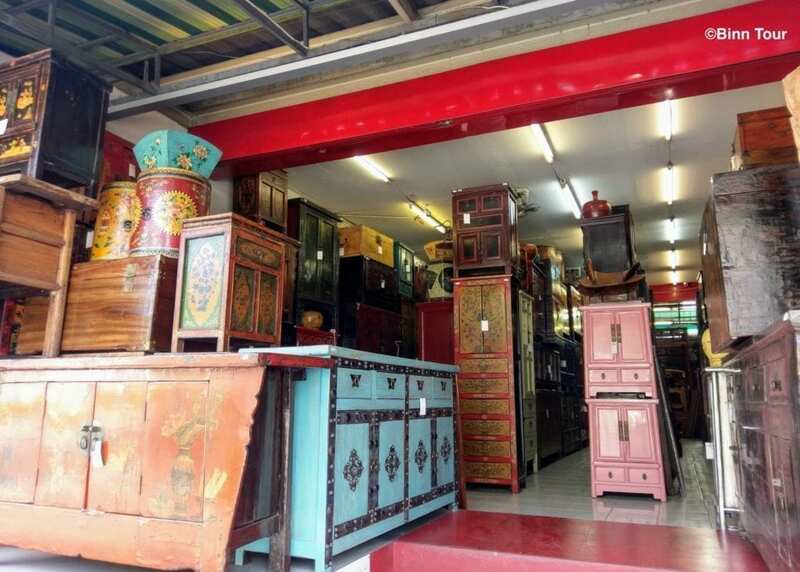 Luckily for me, I do have the address of the shop in question and it looks something like this: Section 25 Soi 2/4 Room No. 091. The number after the slash identifies the alley branching off from soi 2. I don’t mind, because neighboring vendors will likely propose similar products. I find the desired product just around the corner and after some successful bargaining (at least from my perspective), I have accomplished my mission. As often, I spend the rest of my visit in the animals section. Every time I come here I’m amazed by the diversity of “pets”. 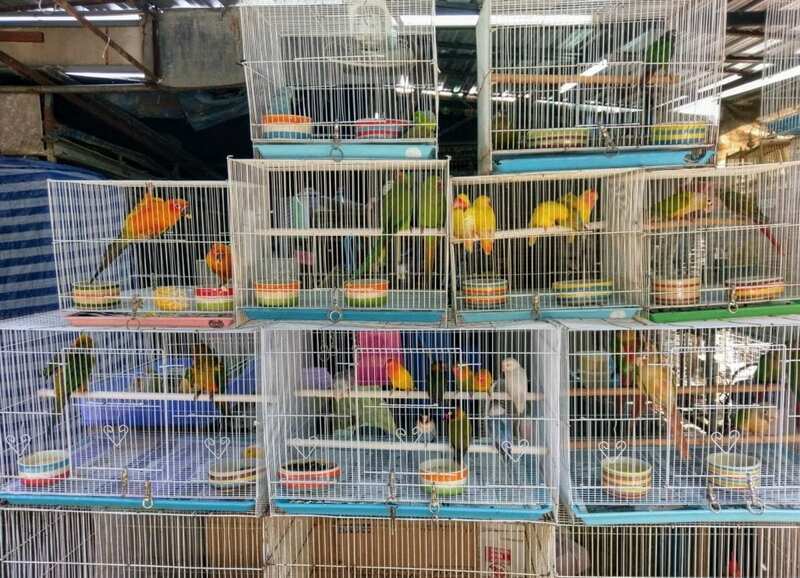 You can find dogs, turtles, fish and even hedgehogs for sale. It’s almost noon. I have a sip of ice mocha in one of the many pop-up coffee shops inside Chatuchak and leave the market with more purchases than I planned. I guess that makes me a typical visitor of Chatuchak! Chatuchak: What can I buy? There is a huge range of products at Chatuchak from clothes (new and secondhand), food, plants, furniture, handicrafts and pets to antiques. Even if you’re not looking for anything in particular, you will surely find some inspiration. However, watch out for counterfeits unless you are happy with the product. Especially when it comes to art objects and antiques, it is difficult to distinguish real quality. For those sorts of things it is best to come with an expert. 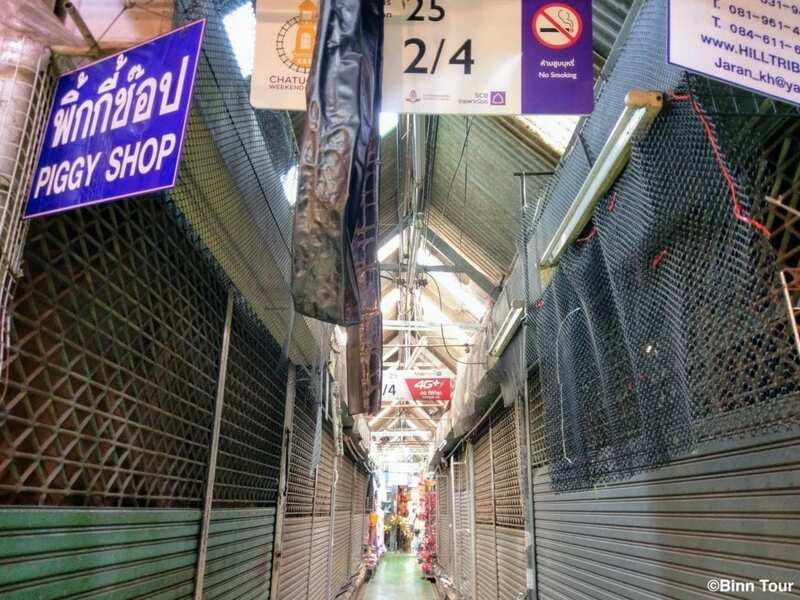 Chatuchak: How do I navigate through the market? Let your curiosity guide you! Even if it means losing your sense of orientation for a while. This is what makes Chatuchak so special. It is one of the rare places where you can actually get lost and discover so many unexpected things. However, if you want to keep track, there is a system as described above to help you navigate and position yourself. 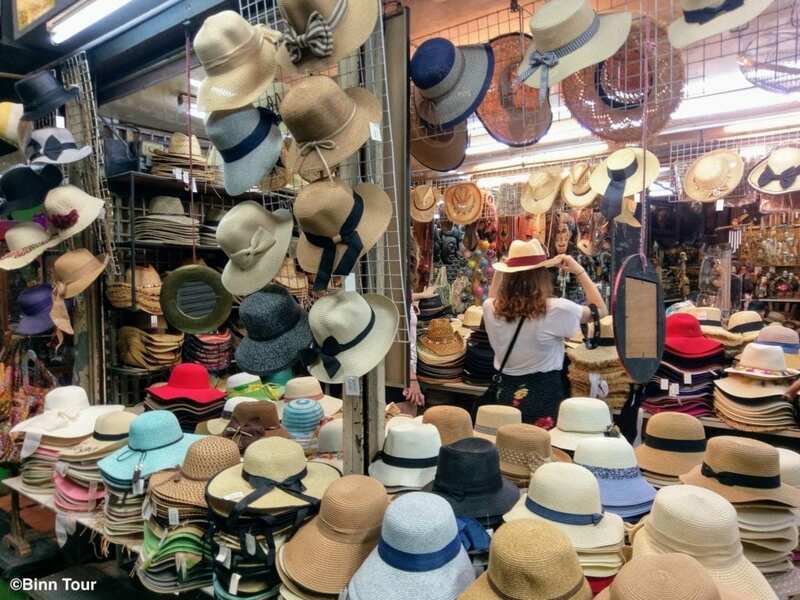 Chatuchak: How do I get a good price? Good question… you could certainly go around every single market stall in order to identify the lowest price. But that might take a while and chances are you won’t find back… Or you practise your bargaining skills. At Chatuchak it is very common and almost expected to negotiate the price. Some will find it quite enjoyable and a fun experience while others may think it’s annoying. Keep in mind that in most cases, it’s just about a couple of bucks difference. It’s no use insisting too long on a certain price. If the vendor doesn’t want to sell at your given price, just try it at another stall. The entrance to Chatuchak is free. You should wear comfortable shoes and bring a backpack for purchases. Ideally, start your visit in the morning when it’s not too hot and crowded, or come late afternoon. Chatuchak is open on Fridays from 6 pm to midnight, and on Saturdays and Sundays from 9 am to 6 pm. The plant market which is actually outside of Chatuchak is also open during the week on Wednesdays and Thursdays from 7 am to 6 pm. 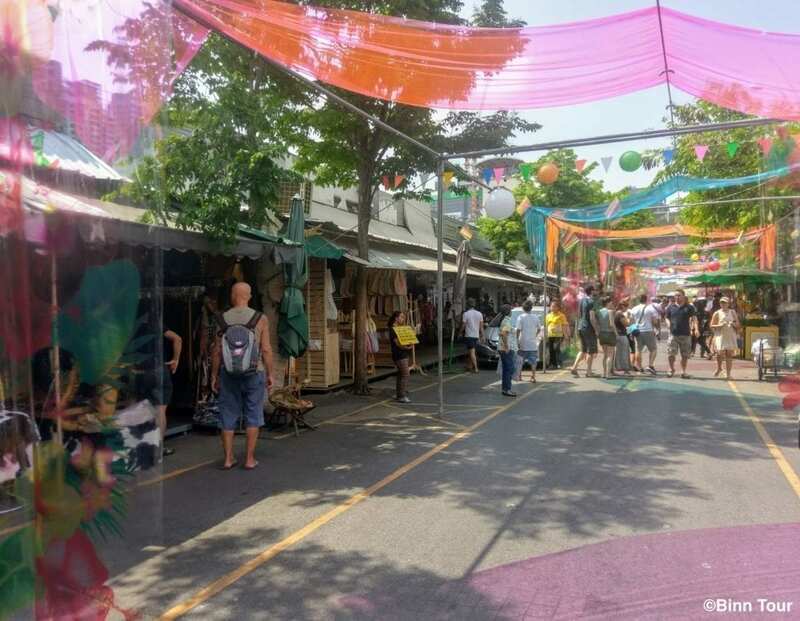 The Chatuchak weekend market is near the BTS station Mo Chit (exit 1) and the MRT stations Chatuchak Park and Kamphaeng Phet. Sawasdee krub, my name is Binn (บิน). 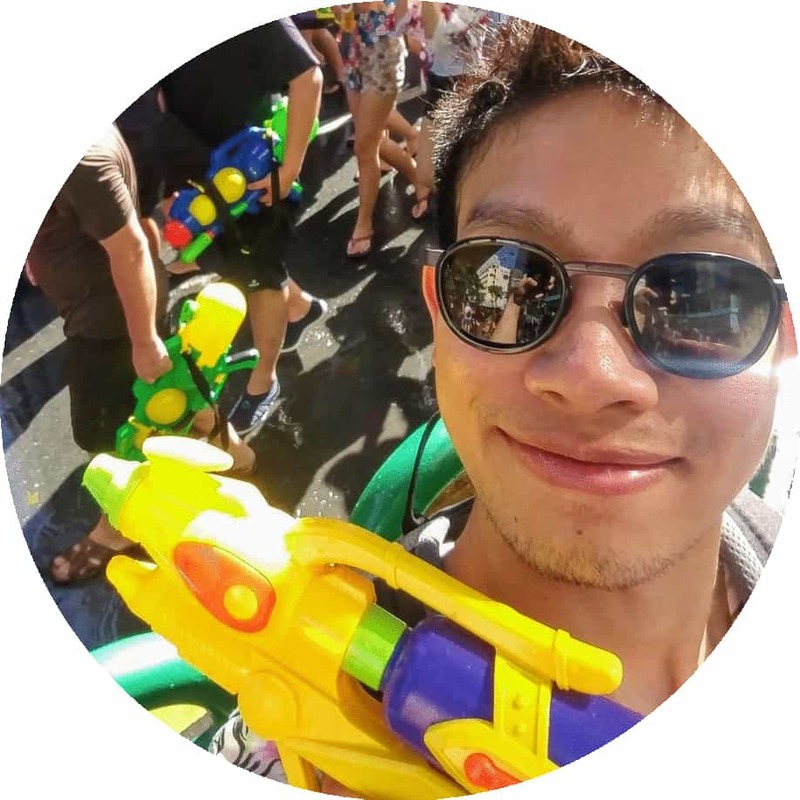 Welcome to my Bangkok travel blog! ICONSIAM – Just another shopping mall? Did you say mango sticky rice tart?